Each Little Pim theme is broken up into seven short episodes. Because we know babies and toddlers have short attention spans, Little Pim was designed to allow you to start and stop after any of the five-minute episodes. Older children (2-6) may enjoy watching the seven short episodes in one sitting. You can pause the episodes at any time and interact with your child to help reinforce the new vocabulary. Here are some tips so you can become your child’s first language tutor even if you don’t speak the language yourself! As you and your child watch the episodes, repeat the words and phrases aloud. If you know the vocabulary, you can comment on what is happening or predict what comes next. Speaking and interacting with the video is an effective way to engage your child and enhance their learning. How many hours per weeks should my child watch? Our recommendation is for babies and toddlers to watch at least two five-minute episodes two to three times a week, and for older children to watch all seven episodes. It is best to expose your child to the sounds of the foreign language as often as possible. Learn with your child and make it fun. Practicing along with your child keeps him or her motivated and engaged. Put post-its around the house or find objects mentioned in the videos right after watching, and name them together in the new language. If your child makes a mistake, simply reinforce the word and show that you’ve understood, then repeat the word with the correct pronunciation. You can refer to the videos for proper pronunciation. Enroll your child in a language playgroup. Find other parents with children who are learning the same language as your child, and get together weekly for singing, stories, and play in the foreign language. If you do not have access to one, start one yourself! 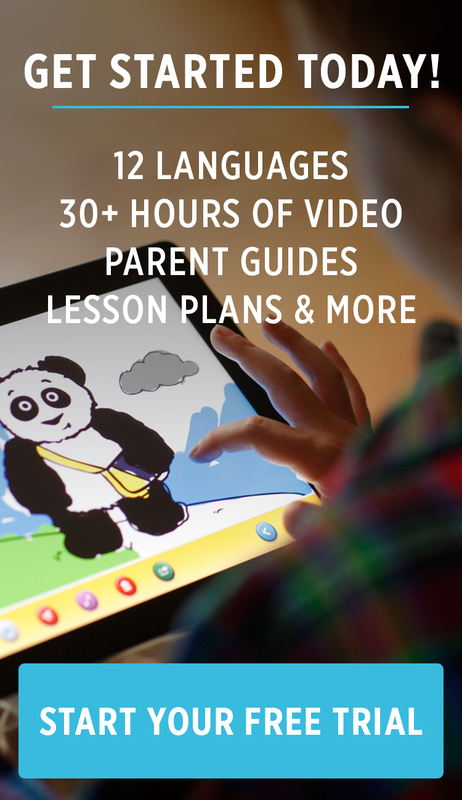 Engage your child in the foreign language whenever you can. Use his or her favorite toys or everyday objects to talk about vocabulary you have learned. For example, use the new words as you cook, or pretend that his or her stuffed animals are having a tea party and reinforce the vocabulary in the series. Older PostWhy Should My Child Learn a Foreign Language?